As you will see, there are really only three main elements that truly matter when it comes to producing a really great skate sharpening result. As it turns out, nailing those three things can be difficult, even for the most experienced skate sharpener. In traditional skate sharpening, there are many mechanical and human variables that can change make or break a perfect sharpening. This is why many hockey players will drive 30 minutes or more to get their skates sharpened by a person they know and trust. 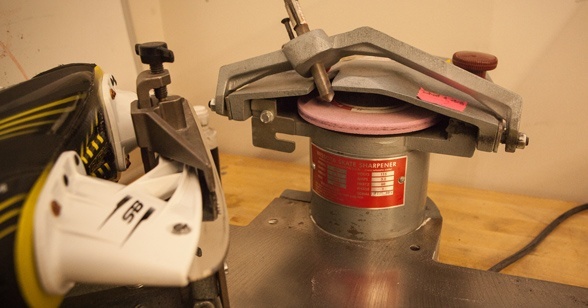 As hockey players, when we find a great skate sharpener, we tend to stick with them regardless of the inconvenience that may come along with it. The three main factors that make up a perfect skate sharpening are Even Edges, Sharp Edges and a Smooth Surface Finish. That’s it. If you are able to nail all three components, you have a perfect sharpening. Miss one aspect and it doesn’t matter how great the other two are – you will have a bad sharpening. Let’s take a look at each element individually to better understand why each component is important. When you skate, you are actually skating on two separate edges (or points) of the blade. When you sharpen skates, you are “hollowing” out the middle part of the skate blade to create two distinct edges as shown above. If one of these edges is higher or lower than the other edge, you will not be able to turn properly in both directions. A lot of times when people say “I lost an edge” they are actually experiencing uneven edges and are slipping out of turns because the height of each edge is not the same. There are several ways to test for even edges, but the easiest way is to simply use the coin test. With the blade facing the ceiling, carefully balance a coin (preferable a US quarter) on the skating surface. Bring the skate blade to eye-level and look down the blade towards the coin. If there is a significant height difference between the inside and outside edge, it will be visible; you'll see one side of the coin will be higher than the other. If you see this, bring the skates back and ask them to fix them so the edges are once again even. If the coin is even, your edges should be even. You can also check your edges with an edge checker, although it is important to know that there are instances when an edge checker can give a false reading. You can read more about that situation here. This important component of skate sharpening shouldn’t come as a surprise! The key to confidently turning and stopping is knowing that your edge will be there when you need it and making sure those edges are as sharp as you want them. But how is “Sharp” defined? When we say sharp edges, we mean that the inside and outside edges of your skate blade are thin and clean, without nicks or burrs. A burr in a skate blade is caused when sharpened steel “folds” over. To remove the burr, you must stone the blade. You can read more about that here. Many people say, ‘I don’t like my edges too sharp,' but in reality, everyone needs sharp edges. Sharp edges are required in order for hockey players to turn, pivot and stop short. The sharper, the better. A more accurate description for these people would be “I don’t like my hollow too deep.” You can learn more about how different hollows impact your skating with this article. A quick test for a sharp edge is to utilize the fingernail test as shown below. Hold the skate upside down, place one thumbnail on the edge of the blade and gently pull down and away from the blade. A good, sharp blade will, with very little pressure, easily scrape a layer of your thumbnail, leaving the remnants on the blade. A smooth finish on the skating surface of your blade is the final factor in a perfect skate sharpening. A nice, smooth finish contributes to a near friction-less glide of the skate over the ice surface. Basic science says, the rougher a surface, the more friction created when moving one object over another. The smoother the surface we can create, the less friction or drag we’ll have when the blades are gliding on ice. If you’ve ever experienced skates that feel sluggish, a rough surface finish could be slowing you down. We’ve found that some of the most experienced sharpeners may successful nail Even Edges and Sharp Edges, but miss on Smooth Finish. A proper sharpening will leave a mirror-like finish with nothing more than very fine lines visible that run the length of the blade as shown below. A rough surface, which typically is visible, oftentimes has a snake skin like or scalloped pattern as show below. If your blade looks like this, you do NOT have a Smooth Finish and you are not getting the best possible performance out of your skate blades. Once you determine that you have each of the three key elements of a good skate sharpening, you are ready to hit the ice with confidence, knowing that your skate blades are perfect. If one or more of these elements are not perfect, you should immediately get your skates re-done so that you can maximize your performance.